The AllBright Academy recently approached Hatty Fawcett, Founder of Focused For Business and an AllBright Academy Ambassador, to ask her advice for finding, approaching and pitching to investors. Here Hatty shares her top tips. Investors can be almost anyone. When I raised investment for my business my investors included customers, suppliers, professional investors and even people who knew me through a shared hobby. The point is, almost anyone can be an investor, so you need to be ready to pitch at any point. Approach people you know first – people who see firsthand the hard work you are putting into your business. Why not approach friends, family, employers, suppliers to the business and even your customers. They can help you get an investment round started. 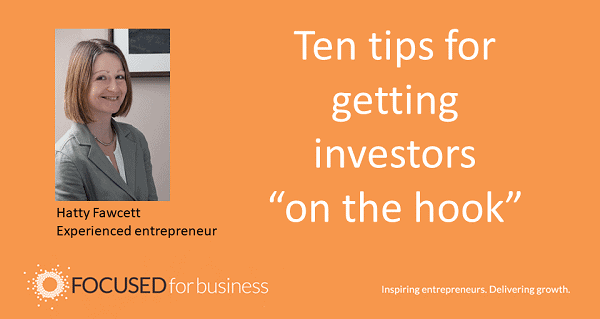 It’s a lot easier to attract new investors when you already have your first few on board! Professional investors – sometimes called Business Angels – tend to be busy people; it can be difficult to find these people and even harder to get their attention. You will need to have a short pitch (sometimes called an “elevator pitch”) that you can use – in either written or spoken form – to quickly give investors an introduction to your business, giving them enough information to pique their interest. It is often easier to get a meeting with a business angel if you have a mutual connection to introduce you. If you have someone in mind that you’d like to approach, use your network (and LinkedIn) to try and find someone that can make that introduction. If you’re not sure who you want to approach, another way of getting started is to reach out to your network explaining what you are doing and asking for any suggestions they have as to potential investors. A one-page executive summary of the investment opportunity (not of your business plan) is a key tool in your investor toolkit. Written well, this should give investors the information they need to make a decision as to whether this is an opportunity for them. Whatever you do, don’t send your pitch deck. A pitch deck should be presented and isn’t a standalone introduction to your business, save that for when you actually meet the investor. All investors are individuals – they have their own particular interests, focus and areas of activity. Professional investors (such as business angels, private offices and equity funds) will often not agree to meet you – or perhaps even to talk to you – until they have seen something of the opportunity first. Don’t expect professional investors to back you after just one conversation. They will need to get to know you and your business. This is best done face-to-face so your initial aim should be to get a meeting or a skype session in the diary. Professional investors are busy people. Don’t assume they will get back to you. You need to take the initiative and keep the conversation alive by following up with them. After every conversation, meeting or pitch, schedule time to follow-up with the people you have spoken to and get their feedback on your investment opportunity. Ask if they have any questions or concerns and – of course – whether they are interested in investing. demonstrate that your business is evolving and growing every day. When following up with a business angel be ready with a juicy piece of new information that demonstrates your business is continuing to grow. This could be news that you have secured a new contract, delivered a key partnership, or the results of a new marketing campaign. Not everyone you talk to will back your business. Get used to hearing the word “no” and moving on. It’s better to know that someone isn’t interested in your opportunity than to waste time talking to them when they have no intention of investing. Move on! Use every interaction as a chance to learn something. Ask everyone you speak to for feedback – even if they are not interested in investing. Their feedback can improve your understanding of how others perceive your business and can help you adapt your positioning, if necessary. Ask for help from the people you speak to too – who do they know who would be interested in this opportunity? Will they introduce you? Raising investment is hard work. It can feel relentless and if you have a run of “nos” it can bruise your confidence. Do what it takes to stay positive and keep your energy up – take an afternoon off and do something you love to boost your morale. Then get back to it, refreshed, revitalised and believing good things come to those who persevere! So you want to raise investment? Rather than leaping straight into action writing a pitch or talking to investors, take a moment and ask yourself three questions. What will you do with the money you raise? How will your business change and grow as a result? If you can answer these questions properly – not just in an off the cuff manner – but by providing real detail, facts and figures, then you probably are ready to raise investment. But the devil is in the detail. Investors don’t back ideas, hunches or broad-brush thinking. They want proven products (or services), thoughtful plans and evidence to support your approach. These things aren’t just conjured up by brainstorming, desk research and theoretical plans. They are created through action, hard work, persistence and a lot of iteration. I touted my theoretical business plan around VCs and angels before the penny dropped that I needed to get the business going before anyone would back me. I learnt that the hard way. I touted my theoretical business plan around VCs and angels before the penny dropped that I needed to get the business going before anyone would back me. The next time I tried to raise investment, (just six months later – but six incredibly busy months) I had not just a web platform but paying customers and a detailed marketing strategy. I raised £150K in one week – from pitching to money in the bank. The proof was in the pudding. Investors call this “traction” and it speaks lounder than words. If you have a business idea but nothing tangible yet, don’t waste your time talking to investors. Instead invest your time into creating your product/service/app. It doesn’t need to have all the bells and whistles but it needs to deliver the essence of what customers are looking for. This is often called an MVP or minimum viable product. It allows customers to trial your product, give feedback and for you to understand what needs to change to meet your customers’ needs better. How do you fund this? Invest your own money (if you can), talk to family and friends to see if they will lend/invest money or explore a start up loan (but be aware that you will probably have to start making repayments immediately so be sure you can generate revenue quickly or negotiate a repayment free period). You don’t have to spend a fortune to develop an MVP. In fact, it’s better if you don’t – the chances are your MVP will change when you get customer feedback. If you have got an MVP, focus on getting your first customers – whether they are paying you or not. Being able to demonstrate you can attract paying customers is best, but honest – hopefully positive – feedback can be just as valuable. Work on really understanding your customers – who they are, why they like the product and how you could find and sell to similar customers. This information is gold dust for your marketing strategy. Tried and tested marketing strategies do attract investment. Work on really understanding your customers…Tried and tested marketing strategies do attract investment. And then? Well, it’s back to the three questions we started with. To gain investment, you will need to explain in detail how much money you need, what you will do with it and how that will grow your business. Growth is the key here. Investors don’t want you to stand still. They want you to create value by finding better ways to work, developing new products, attracting more customers. Investment isn’t philanthropy. Investors want a financial gain and that is created when the business grows – fast. Investment isn’t philanthropy. Investors want a financial gain and that is created when the business grows – fast. If you’d like to speed up the process of getting investment, it’s worth talking to a professional. Someone who understands the process, someone who has “been there, done that”. Investors are looking for specific information when deciding whether to invest and it pays to get the inside track on what you’ll need to provide – as well as having someone to help you prepare, to challenge you and give practical advice on how to improve your pitch. If your business is ready for investment, sign up to Fast Track to Funding – designed to save you time and make it quicker to attract investment.